In the 1973 movie "Sleeper," the hapless, frazzled character played by Woody Allen makes a hyperbolic but ineffectual threat to a screaming Diane Keaton: "If you don't shut up I'm gonna take this rock and bring it down on your head so hard that a substance resembling guacamole is gonna come out of your ears." I thought of that line rather often while watching "The Raid 2," in which the cops and criminals doing incessant battle have to go to similar lengths to vanquish, or even just temporarily incapacitate, their foes. With disquieting frequency, a fractured limb, a baseball bat to the cranium, a bisecting slash to the external carotid artery, that sort of thing, simply aren't enough. No, in the world of "The Raid 2," you've got to get your foe on the ground, and bang his (or her!) head against the floor or the pavement until…you know. Only the substance is red so it doesn't really resemble guacamole. In addition, you wanna go for severely dislocated jaws, third degree burns where you least want to see them (I understand this raises the question of where you most want to see them, and that IS deliberate), potential/partial disembowelings, and more. 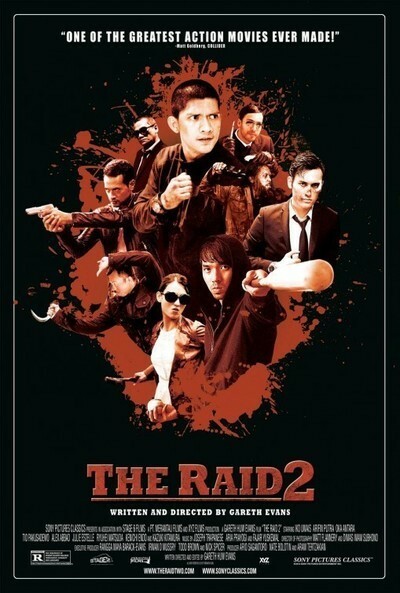 This movie, as its title implies, is a sequel to "The Raid: Redemption," the 2012 Indonesian action film directed by the Welsh-born Gareth Evans, whose cinematic mission in life was, some reports have it, handed down to him when he was first exposed to the Indonesian martial arts. The nearly non-stop action of "The Raid," which is an epic depiction of a drug raid on an apartment block in which hordes of cops and criminals have at each other, is largely martial-arts driven, but with plenty of shooting and slashing, all of it shot in excruciatingly you-are-there close range and edited to both make your head spin and give you whiplash. Action aficionados hailed the movie as some kind of ne plus ultra, and Evans has clearly been eager to answer the fan question "How is he gonna top THAT?" Evans does get around to topping it, with a climactic sequence that's about 45 minutes worth of mayhem that includes a very crunchy car-chase/shootout and a one-on-one battle that destroys a climate-controlled wine room in high style. The plot is both simplicity itself and impossible to follow: Rama, the hero of the first film, is compelled to go undercover to rout both corrupt cops and crime lords and the lethal henchmen of both camps. It's impossible to follow because there are just so damn many crime lords etcetera to keep up with, not that they're all that distinctive. The Fredo-esque son of one crime lord, Uco (Arifin Putra) distinguishes himself with sleek features and a jaded air, both of which genuinely suggest that he'd rather be fronting a Suede tribute band than doing mobster stuff. That's probably not a good thing. I also found that Oka Antara, who plays a stalwart enforcer who's not quite what he seems, gave better action leading man than Iko Uwais, who plays Rama. None of this much matters of course. What matters is a machete-wielding contract killer, a pair of baddies who kill with baseball equipment and hammers, respectively (the latter character is named "Hammer Girl," say what), and all the sound and fury that is delivered with such a relentlessly straight face and gritted teeth that Tarantino's "Kill Bill" pictures look like "The Gang's All Here" by comparison. The intensity really falls flat during the scenes in which the action stops and various characters ponder the vicissitudes of loyalty and betrayal and all that. These sequences suggest that the lack of anything BUT action in the first movie was an indication of Evans realizing his limitations. In any event, nobody's going to mistake these passages for Shakespeare. But the action stuff in "The Raid 2," while likely to alienate the squeamish and summon dark thoughts of cinematic nihilism amongst overthinking highbrows, really IS like nothing else out there. All those looking for a new kick are advised to seek it out, but don't blame me for the headache with which you might leave the theater.